Triple distilled then matured for over twelve years. Our Lowland Single Malt Whisky has the tempting aroma of toasted almonds, caramelised toffee and the signature smooth, delicate, Auchentoshan taste. Tasting Notes To The Eye Golden honey. To The Nose Creme brulee, a burst of citrus and the signature nuttiness and green leafiness of Auchentoshan. To The Tongue Smooth and sweet with hints of tangerine and lime. To The End Gingery and slightly drying, with a pleasant lingering nuttiness. When Tomatin Distillery was established in 1897, the isolated and idyllic setting of Tomatin was almost perfect. However there wasn't a local workforce; the local inhabitants were scattered shepherds and cattle drovers. The company began a project of construction to accommodate its workforce. Since that time the distillery has been at the heart of the community and the community at the heart of the distillery. This legacy has continued and Tomatin remains one of the few distilleries to provide a home for its dedicated craftsmen. 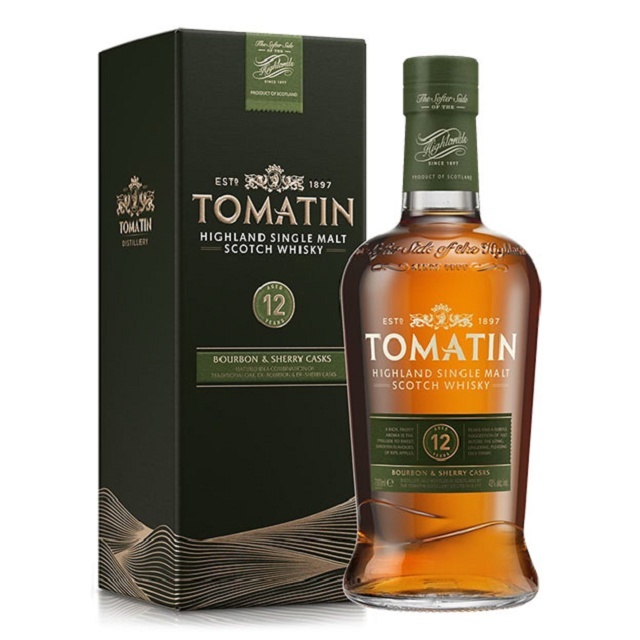 Time in Bourbon barrels and Virgin Oak casks brings a light sweetness to The Tomatin Legacy, which boasts aromas of vanilla, marshmallow, pineapple and lemon. On the palate gentle flavours of candy, pine, lemon sherbet, apples and sponge cake emerge ahead of a light, clean finish. Wild Turkey American Honey is an exceptionally smooth liqueur blended with pure honey and Real Wild Turkey Bourbon Whiskey. Perfect served chilled straight from the freezer, over rock. The Bowmore Islay 'Legend' Single Malt Scotch Whisky is a true Islay malt. With up front notes of brine, salt and iodine, this is a fierce malt that lovers of the style will be clamouring for. Superb length of flavour is also a major characteristic of this Bowmore that is simply perfect when poured neat. Bowmore 12yo has a place in many hearts as Islay's 'medium-peated' malt. A pronounced iodine character with plenty of pepper, yet the malt is balanced and smooth as well as smoky Tasting Notes: NoseFloral and peaty. Wet earth. Cold fireplace. Opening on briny notes, fishing net. Smoke is rather distant. PalateSmooth, sweet. Peat is not discernable at first. Then a light smoky flavour. FinishMedium, drying on lime peel. A hint of dry ashes. CommentPeat is integrated in oak though wood is not overwhelming. Water changes the rules, bringing peat and smoke forward. The Bruichladdich Scottish Barley The Classic Laddie has been craftet from individually selected casks to showcase the classic, floral and elegant Bruichladdich house style. Unpeated, it is Bruichladdich's signature bottling. Made from 100% Scottish barley, trickle distilled, then matured for its entire life by the shores of Lochindaal in premium American oak. Glenfarclas 12yr Old Single malt 1 Ltr: Nose: Light and creamy with a mix of supple, soft sherry and Manuka honey. Gentle and well-balanced, there are hints of smoke, rich oak, and a little pine resin. Palate: Medium-bodied, with notes of date and walnut cake, Oloroso sherry and hints of earthy forest floor. A beautiful note of malt, with toffee apple and a touch of smoke. Finish: Spicy and long, notes of allspice, cinnamon and cloves, with orange zest and sherry. Just as fellow flavor Absolut Pears, Absolut Mango was introduced in 2007. The flavor, quite obviously, is based on mango – a word that’s more or less the same world wide. That in combination with the juicy taste, might very well be the reason behind the instant world wide success. Absolut Mango is made exclusively from natural ingredients, and unlike some other flavored vodkas, it doesn’t contain any added sugar. Absolut Mango is full-bodied and juicy with a character of ripe mango and notes of tropical fruits. The original expression of our elegant, floral spirit and the real backbone of the Glenmorangie range. A ten-year-old single malt, Glenmorangie Original is produced by marrying the delicate spirit that emerges from Scotland's tallest stills, with first and second fill American white oak casks. It is here, maturing for ten long years in a range of ex-bourbon casks such as our famous slow-grown and air-dried 'designer casks' from Missouri, that our raw spirit develops a perfect balance between sweetness and complexity. Resulting in a mature spirit that is soft, mellow and creamy. Perfect for enjoying at any time. ABV: 40% The connoisseur in search of a new whisky expression will be captivated by the 12-year-old single-malt Quinta Ruban. Dark and intense, this extra-matured whisky is one to savour. Undergoing a second round of ageing in ruby port wine casks, Quinta Ruban pushes the boundaries of whisky craftsmanship. Unusually velvety and voluptuous, it makes a delectable digestif.